I woke at around 8am, with another glorious blue sky overhead. Pete stuck his head on my door and checked if I wanted coffee. I luxuriated in bed with a coffee and my book for about an hour, then realised that my iPhone time had changed for NSW and that I really should have been on watch. Oh, well! Everyone else was up and enjoying the beautiful morning anyway, so I eventually dragged myself out of my cosy bunk, and had cornflakes and banana for breaky. A cup of tea and feeling awake enough to don the bikini to make the most of the wonderful weather. There was a little rain in the forecast ahead, so today is the day to ensure the tan is up to scratch! Clare made bread, Paul filled the fuel from the gerry. Pete played with the B&G and I was on look out. 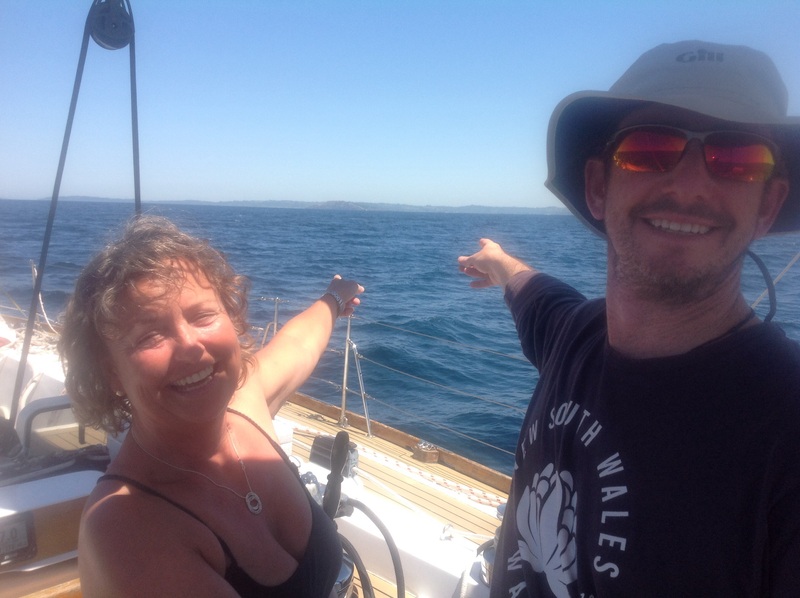 As I was sitting comfortably in the stern, watching Cape Byron draw steadily nearer, with Paul and Pete concentrating on refuelling, suddenly my view was blocked out by the belly of a whale who breached almost right in front of us. The most incredible grandstand view of almost the whole whale! I yelled out in surprise, convinced he would be either on our foredeck or we would run him over, but of course he was back in the water before the others had a chance for a look and Clare popped up from below with her camera. I cannot believe I didn’t have a camera of some sort handy, but I have the most amazing picture of the whale in my memory! 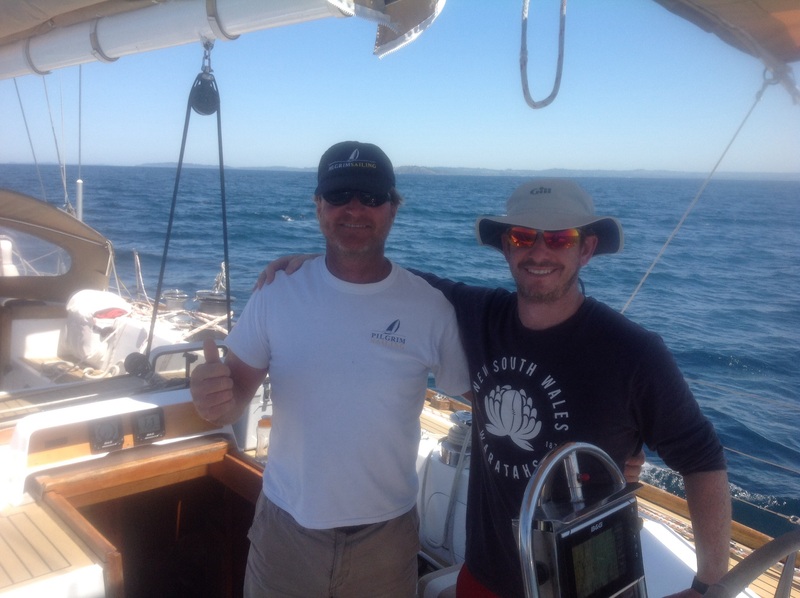 We continued to have whale sightings, over lunch, and then thought we should sail as there was enough wind, though it was fairly well behind us. We started with the main, then added the heady, then the asymmetric. With the assy up, we were holding a really comfortable 7 to 8 knots in around 8-10 knots of breeze. As the boys took an afternoon nap, I hand steered for a change. At one point Pete said he could hear whales, so we kept a careful look out but nothing seen. However about half an hour later on the port bow, I spotted another breach, though this was a fair way away. Clare got out the camera as this was a very active whale and we altered course to move closer. We got within about 200 meters as the whale, possibly 2, continued to breach, tail flap, spout and fin flap. Clare got a few more pics, and Paul eventually made it on deck as the whales were heading off behind us. As we had a time change, sunset was much later than we are used to, so we decided to prepare for the night before sundowners, given the forecast was set to increase from the north up to 20 knots. We took down the assy as we started to see upwards of 15 knots, and also decided to pole out the heady as the wind was pretty well behind. Thus comfortable, we settled into sundowners followed by dinner, then watches started at 7 pm. I was first on for the last of twilight, hand steering as the swell was not great for the chook pen, and other than an unidentified red light on my starboard bow which disappeared and couldn’t be seen on either AIS or radar, all was relatively quiet. Clare settled in after 5 minutes and I went off watch. Sleeping was almost impossible, the swell was really ugly and knocking poor Pilgrim around in a very weird corkscrew manner, with the whole of the interior shaking and creaking. I got up to check that things were ok under the floor in the wine cellar, and in various cupboards, and all seemed ok. Back to bed, then up again with more noise, as Pete took over driving, and an attempt to sleep in the saloon. That was also unsuccessful. Next I tried the cockpit, which was comfortable, but we were still rolling wildly and then I heard Paul get up and check our heading. 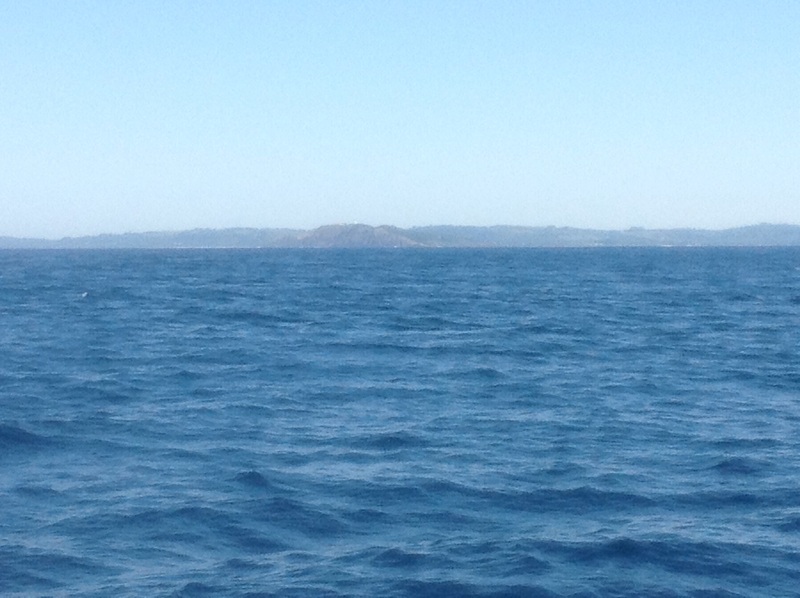 As we were now heading out to sea, we decided to head in, but this turned into a bit of a palaver. First we started to drop the main, but it got stuck about halfway, so we stopped that and furled the heady. Because of our fairly complex arrangement if lines, this was not the easiest of jobs, but it was accomplished and the pole eventually dropped and secured on deck. We then got the main down, tried to get the genny back out, but this wasn’t happening and it was dark and uncomfortable! We ended up with the engine on, less uncomfortable, but Paul called for Bob, so the pole needed to go away, so Pete and Paul got the pole away, then we got Bob out, and finally things were settled down, and we were on course for Coffs. It was about 1:30 am. Clare and I went back to bed and I slept like it was my last sleep, but had some weird dreams. When Pete woke me up it was a relief as I remember cactus hairdo’s, a religious sect and cardboard houses on a sloping field! We were about 5 miles out, but going along well under engine heading right for the harbour. The leads lines up nicely, the breeze stayed up around 12 to 15 knots and there was a bit of cross current at the entrance, but we made it without trouble and had enough tide to make the marina entrance comfortably. We had a brief stressful moment as Clare pointed out we had the spring on as the bowline, but we rectified that quickly and moored without issue at 4:10am. A quick call to Marine rescue to confirm we were moored safely then to bed to sleep the sleep of the dead! What a long night.